That chronic, nagging sense of discontent, that sneaky feeling that something is missing from life, that secret yearning for "something more" can all be healed. In Let Go and Live in the Now, best-selling author Guy Finley brings the great Wisdom Teachings of centuries past into our lives in an intimate, accessible way. 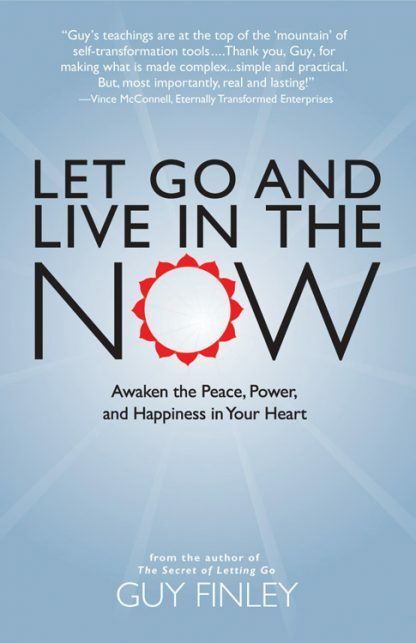 Each chapter of Let Go and Live in the Now tackles a hurt that keeps us from experiencing inner peace and happiness. Every chapter includes a brief essay and a contemporary teaching story followed by exercises to help readers incorporate the teaching into everyday life. Each chapter ends with "Ask the Masters," a question-and-answer format with such historical and modern-day spiritual masters as Buddha, St. Augustine, G.I. Gurdjieff, Henry David Thoreau, Peter Matthiessen, and Jeanne Guyon. "It only seems as though there�s something more important for you to do than just quietly be yourself," writes Guy Finley. Imagined heavens never last, but eternal principles empower readers to live in "the now." From the first story of Katie, her broken heart, and the doctor who shows her how to heal it to the very last lesson of Paul who relocates himself from the city to the country and still can�t see "the forest for the trees," readers see themselves in these eloquent retellings of ancient spiritual principles.